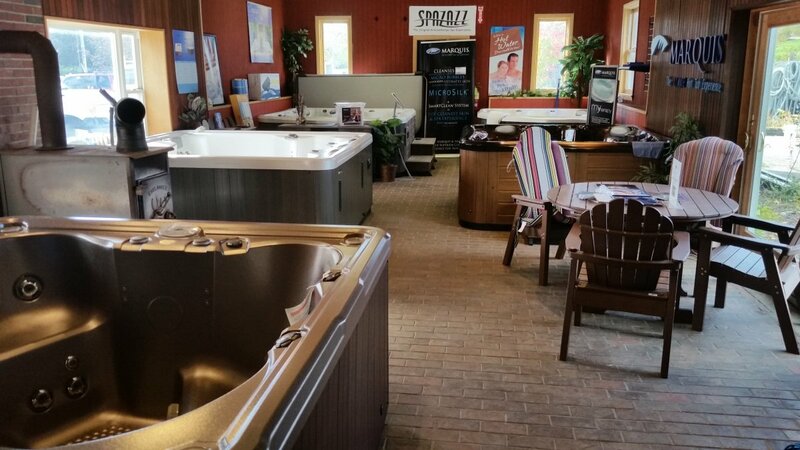 Take a mini tour of our showroom and see what Marquis Spas, Caldera, and Freeflow Spas we are currently displaying. 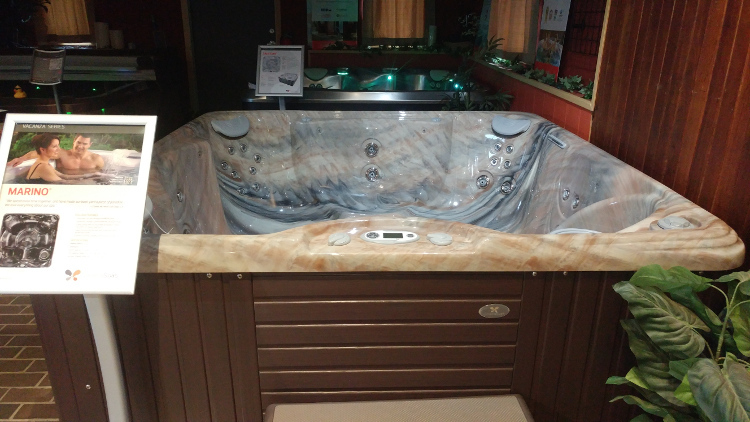 We have some great choices from small 2 person 110v plug and play to big 6-7 person family hot tub models. 6. Caldera Martinique - Consumer's Digest Best Seller! Got a tight space but still looking for the hydrotherapy benefits of deep tissue hot water massage? The Cascina is one of Freeflow's smaller models, yet its open seating still allows room for 4 people to enjoy. It's rotomold 1 piece construction makes it super durable, but light enough to be extremely portable. Great for renters, or vacation homes! The Rendezvous measures 5' 2"x 5' 10" and 32" high So will fit most anywhere. The Euphoria is Marquis' luxury family hot tub. 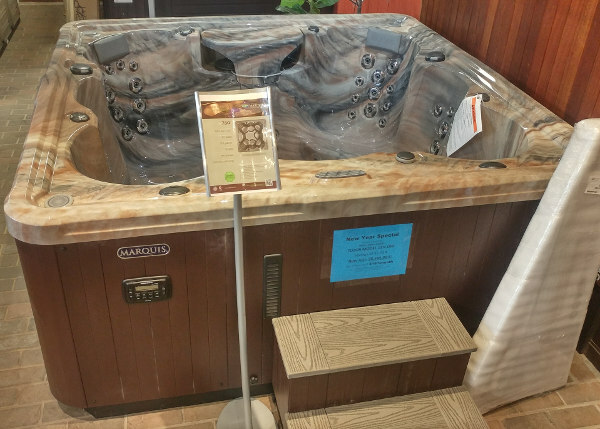 With seating for 7 and some of the best multi level seating in the entire Marquis line, this spa is great for getting the family together and entertaining on the weekends. This floor model has the Ultimate upgrade package. That means it has; bluetooth stereo, LED lighting upgrades, aroma therapy injector, matching steps, and cover lifter all included. THe Aventine is the perfect empy nester's hydrotherapy hot tub experience. Just the right size to fit almost anywhere, but with 2 well thought out seats that make this one of the most comfortable corner spa's we have ever seen. This spa is 115v 20 amp, and comes with a 20 amp receptical and cord. This spa measures 5' 4" x 5' 4" and 29" high so this can go through a standard door into a sunroom or screen porch. Awesome captains chair with rotating wrist jets to ease a day full of typing. 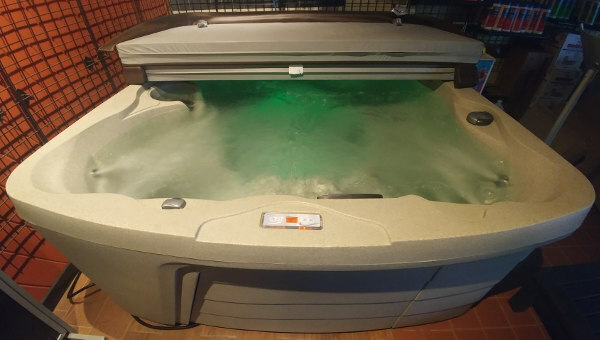 The Cove Spas 500LED is an ultra affordable rotomold 4 person spa. This is a convenient plug and play 110v model, no electrician needed. Simple layout gives you a bench seat on 1 side and 2 deep captains chairs on the other, perfect for 4 but enough room for 5. This brand new Vector spa series from Marquis has been super popular since it launched this summer! And the v65L has been one of our best sellers. Great compant size and one of the most powerful 110v plug and play spas we have. The new Vector series has completely new jetting systems and a great modern look. You want find a better balance of size, comfort, style, and performance than Caldera's best selling the spa...The Martinique. 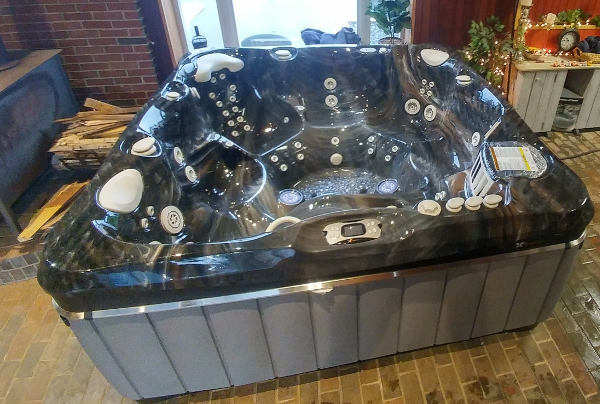 A beautiful 5 person spa with lounger this hot tub is what we call a "Goldielocks" spa, just the right size. The Paradise Series gives it a 5 year parts and labor warranty, 24 hour circulation, and 2lb. density Fibercore insulation. 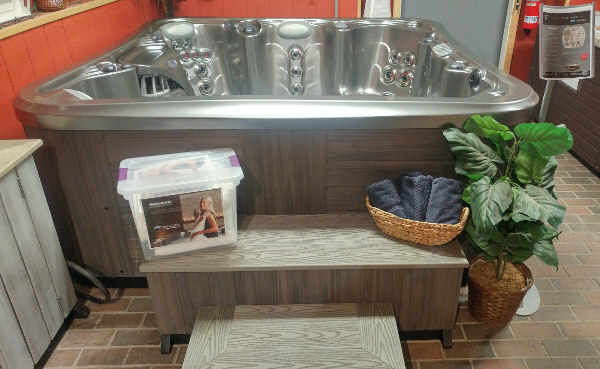 If you are looking for the most spa for your money, you can't really do better than a Vacanza series hot tub from Caldera. The Marino is a very traditional 7'x7' spa with full size lounger. I think the big selling feature of this spa is the size and comfort of each seat. This is a roomy tub! Tough as nails ecotech cabinet and full Fibercore insulation, this spa is built to last. 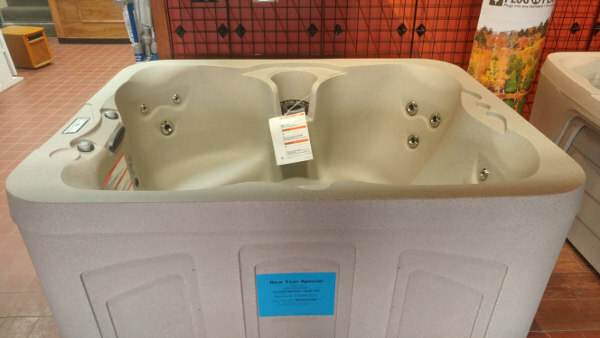 Another great value, 7 person 50 jet 2 pump hot tub, with stereo. That's what you get with the Marquis Eseries 750 spa. One of our more popular 7ft. tubs. 2 160gpm pumps send some tremendous power to the 50 completely adjustable jets. Great roomy 3 person rotomold lounger spa, nice and deep with a well thought out seating design. Great cash and carry deals on all of our rotomold spas. These are light enough to throw in the back of a pick up truck, bring home, plug in, fill and enjoy! 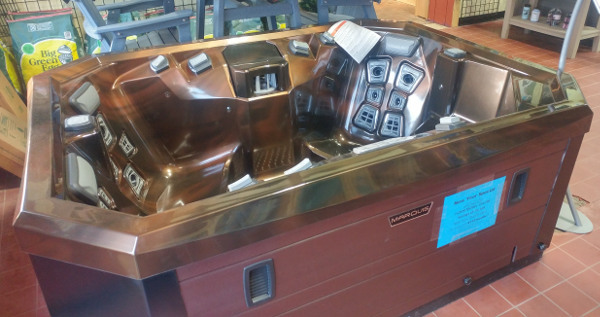 Our largest 110v rotomold hot tub the Freeflow Spas Monterey is a great family hot tub. Seating for 7 with 4 jetted hydrotherapy seats. Awesome multi color lighting and a built in ICE BOX for your drinks! The new Utopia series hot tubs from Caldera Spas, just WOW! Completely redesigned for style, comfort and performance with the help of the acclaimed BMW Design Group, th Geneva is unlike any other hot tub to come before it. The Geneva with its 90"x90" size andf comfortable full length lounger was already one of Caldera's best sellers, but now it is not only a great hot tub, but a backyard statement piece! 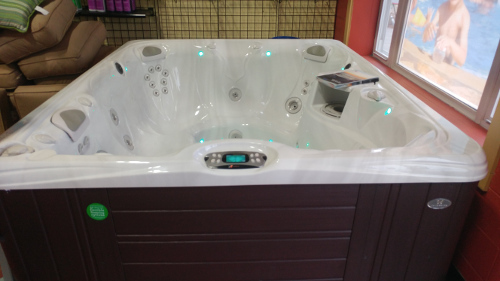 24 hour circulation with built in ozone sanitation and built int mineral purifying system makes this one of the easiest spas to maintain. beautiful new Avante cabinet is virtually indestructible and will add sleek, modern, class to your deck or patio. Well that's the 5 cent tour folks, hopefully you saw something you liked. If you want to see these models up close come visit us: 83 Haverhill Rd. (rt.110) Amesbury, MA. 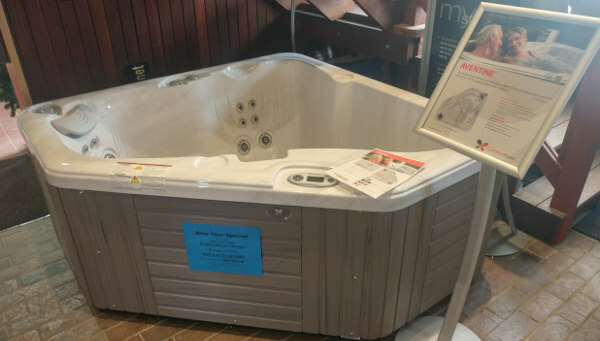 If you are serious about a new hot tub for your backyard it is good to know what type of spa you are looking for and will fit your needs before you start shopping. 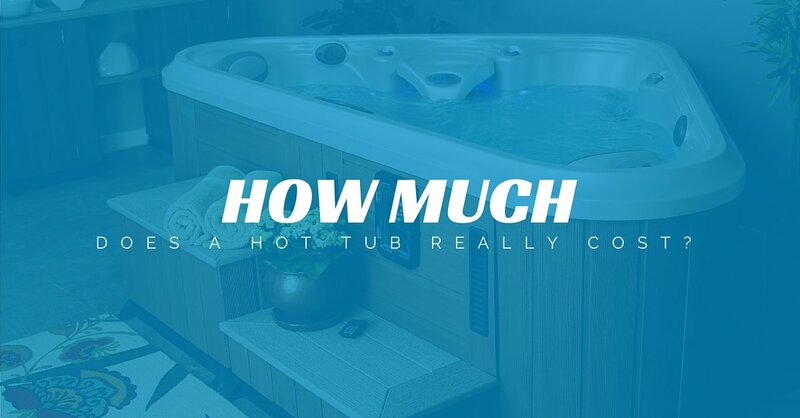 How Much Does a Hot Tub Really Cost?